So I have to admit that I don’t just drink true teas, but I also dabble in herbal teas. 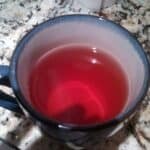 Lately, I’ve been sipping on Blueberry Merlot by Tea Forte, which tastes great if you’re a fan of fruity flavors. I wouldn’t say the blueberry flavor overpowers the drink since there are other flavors that are mixed into the tea such as hibiscus. The tea is described as an organic relaxation tea with no caffeine, so it’s perfect for unwinding at nighttime. It tastes fairly sweet like a juice, but not too sugary. Tea Forte describes its taste as “[t]he deep taste of succulent summer-sweet blueberries with a subtle wisp of sage to heighten an excellent cup.” As far as relaxation, I can’t say I feel a noticeable effect, but obviously it doesn’t wind me you up like a caffeinated tea. Looking at the ingredients, it contains organic rose hips, organic hibiscus, organic blueberries, organic sage, natural blueberry flavor, and organic cornflower pedals. They are definitely focusing on organic here and claim it is certified organic by IMO Switzerland (IMO provides quality assurance on many different products). Tea Forte definitely appears to be concerned with the environment based on the certifications all over the can. You only need to use a teaspoon of the tea leaves per 8 oz of water (technically it has leaves, flowers, seeds, roots, and more). I had incorrectly assumed I would need to add some extra for flavor, but it was enough for a light fruit flavor. The great thing about herbal teas is that you do not have to worry so much about burning the leaves. I brewed at 212 °F for 5 minutes using my Breville Tea Maker with no issues. I had picked up a tin of this tea at the supermarket The Fresh Market for under $15. It is the can that weighs 90 grams and is 3.17 ounces. Tea Forte also appears to offer the Blueberry Merlot in pouches and sachets. 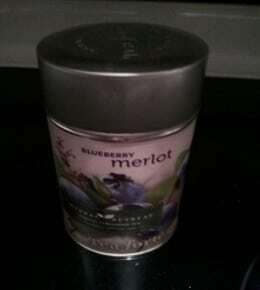 I would definitely recommend Blueberry Merlot by Tea Forte to anyone who loves tea and fruity flavor. I have read some reviews online that this tea tastes lightly fruity, but you may need to brew it longer.